The Zara owner has yet again smashed a Miami record with the $500 million purchase of downtown’s Southeast Financial Center, an iconic office building that seller JPMorgan Asset Management began shopping around earlier this year. In a single deal, Ortega has closed on the largest commercial purchase in Miami this year, blowing past the previous high set by Sumitomo Corp. in May when the Japanese conglomerate burst back onto the Florida real estate scene with its $220 million acquisition of the Miami Tower. 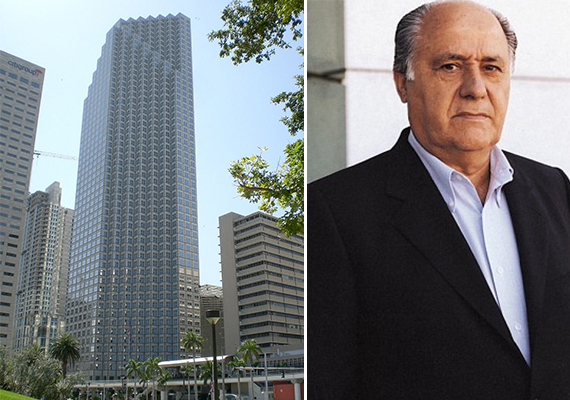 As first reported by the Daily Business Review, citing anonymous sources, Ortega’s purchase covers the 55-story tower and roughly two acres of land at 200 Biscayne Boulevard. Housing an expansive 1.225 million square feet of leasable offices, the sale breaks down to $408 per foot. Commercial brokerage HFF was brought on in June to market the property. Requests for comment to the company, as well as JPMorgan, were not immediately returned. Data from the CoStar Group shows the financial center is just below 88 percent occupied with asking rents ranging from $22 to $47 per square foot — some of the highest in downtown. It boasts a host of coveted tenants ranging from law firms to financial groups, the largest of which is attorney group Shutts & Bowen with 69,155 square feet. Formerly known as the Wachovia Financial Center, Southeast was last traded when JPMorgan bought out its partner on the property, Macquairie Office Trust, for $182.5 million in 2008. The tower was built in 1981 and gained notoriety for its high-end finishes and distinctive design, with each of the upper floors set back to create a staircase-like facade. The deal has yet to hit public records, so it’s unclear whether Ortega has taken any financing for the purchase. It’s another sign that Miami’s commercial markets have become increasing attractive to institutional and foreign investors, who appear willing to pay increasingly high prices to gain a trophy foothold in the city. Sumitomo Corp. did just that earlier this year when it bought the Miami Tower, another iconic office building, in an investment play designed to increase the company’s U.S. real estate portfolio. By all accounts, Ortega has engaged in a similar bout of trophy hunting this year. The Zara owner grabbed headlines overseas in October when his property arm bought a 45-story office tower in Spain, a deal that was said to be part of his plan to grow a real estate empire. He’s well on his way to achieving that goal, having spent nearly $900 million on properties in Miami alone over the past 12 months including his $370 million purchase on Lincoln Road.